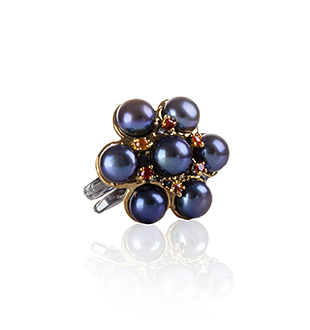 A solid sterling silver statement ring with black rhodium and 18 karat yellow gold finishes featuring fresh water pearl, red garnet, and orange sapphire. Keiko Uno’s Breathe series is inspired by the meditative and calming effect of breathing through a regulator. The series captures the mercurial clusters of air bubbles rising from the outward breath of a SCUBA diver. The Breathe series forms part of Keiko Uno’s luxury sterling silver Rockpool Collection.